Stealing bikes and fighting cops. We got a much closer look at Beyond Good and Evil 2 today, with Ubisoft giving us a whirlwind tour of the 24th century, from ancient ruins to a battle in the sky. If, like Beyond Good and Evil 2’s space pirates, you’re too busy to watch a whole stream, it’s conveniently been condensed into a four minute video. The city of Ganesha looks as gorgeous as ever, with streams of flying traffic speeding past ancient temples and massive golden statues. Every vehicle can be hijacked and flown, and you can go from flitting around the city to travelling across the stars seamlessly. So, while the demo begins underground, it ends all the way out in space. Players control customisable pirate captains who can team up on missions through drop-in co-op, but they can also collect subordinates and put together their own crew. Ships can be tinkered with, too, and then unleashed on the pesky space cops in flashy dogfights. As well as space battles, captains can get in regular sword and gunfights, using augments to pull off special moves. The spyglass seems like a neat evolution of Jade’s camera from the first game. At its most basic, it’s a telescope, but it’s an extremely powerful one with a built-in scanner. Point it at a person and you’ll get vital information that might make them easier to defeat in a fight, or you could identify a potential recruit. Use it in space, however, and you’ll be able to get details about cities and points of interest dotted across the worlds you can explore. 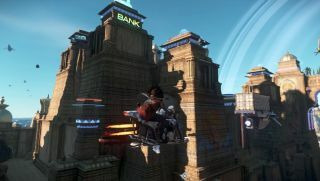 This is the same Beyond Good and Evil 2 demo shown off at E3, and like Phil said at the time, the scale is impressive, but it’s still not really clear what Ubisoft is going to be doing with this massive sandbox.